Proper book publicity is vital for the successful launch of a book. Now, if you’re an author who is being published by a major traditional publisher, publicity will usually be handled for you. However, what if you’re being published by a smaller press that doesn’t have the marketing and publicity resources that a large publisher has? Well, if you have the budget for it, you could work with a professional publicist directly. Below you’ll find 19 top independent book publicists. Stephanie Barko is a book publicist who specializes in promotion historical fiction and nonfiction titles. Based out of Texas, Stephanie has been working in the publishing industry since 2006 and has a ton of expertise and industry insight that she uses to assist her authors in reaching a wider audience. She loves to work with either traditionally or independently published authors, and prefers to work with authors who have a professionally edited manuscript ready for the market. She can assist in expanding your book platforms, arrange for pre-publication endorsements, reviews, and author events to help spread the buzz around your title. If you’re interested in working with Stephanie, you can contact her via email or through her website’s online contact form for more information. Based out of California, Paula Margulies is the publicist and owner of Paula Margulies Communications. With over twenty years of experience in the realm of public relations, she has all of the resources and contacts to help promote your book before and during its launch. As an author herself, Paula knows exactly what it takes to create hype and excitement around an author’s project. She can help set up book signings, help you launch a website promoting your work, get in contact with newspapers, magazines, and websites to garner positive pre-publication reviews, and more. If you’re interested in working with Paula, you can contact her via phone, mail, or email. You can find her contact information here. Audra Jennings is a freelance book publicist based out of Corsicana, Texas. She also happens to be the publicity manager for New Growth Press, and is the co-owner of The Crafty Dad and Daughter. She has worked on press kits for titles like “Gathering of Sisters” by Darla Weaver, “Buried Dreams” by Lindsey R. Dennis, and “The Marriage Mentor” by Steve and Rhonda Stoppe. She can assist authors by setting up book tours, signings, and set up pre-publication reviews to help create buzz around your title. If you’re interested in working with Audra, you can contact her via email to request more information or for a project quote. Alyson Sinclair is a freelance book publicist and began her own publicity company in 2013. Based out of the Great Minneapolis-St. Paul region, she has worked in the publicity departments of companies like Farrar, Straus and Giroux, and City Lights Publishers. She likes to work closely with her authors at least six months in advance of the project’s intended launch to help drum up excitement about the title before release. She’s worked on projects like “Isako Isako” by Mia Ayumi Malhotra, and “Ghost, Like a Place” by Iain Haley Pollock. If you’re interested in working with Alyson, you can contact her via email or check out her LinkedIn page for more information. Andrea Burnett is a book publicist that primarily focuses on nonfiction works, specifically lifestyle topics like food, parenting, travel, and fashion. She has worked with publishing companies like Chronicle Books, Workman Publishing, Hay House, and more. Based out of Richmond, California, Andrea has worked on projects like “Top Five Regrets of the Dying” by Bronnie Ware, and “Unbinding the Heart” by Agapi Stassinopoulos. Andrea is able to help identify and target your audience and market to them, schedule meetings and interviews with various media outlets, and organize book tours. If you’re interested in working with Andrea, you can contact her via email for more information or for a project quote. Danielle Barclay is the primary publicist and owner of Barclay Publicity. They can assist authors in author branding, scheduling book signings and tours, manage social media branding, assist with advertising strategies, book formatting, cover design, and more. Danielle has worked with authors like USA Today Bestselling Author Kerry Adrienne, and New York Times Bestselling Author Noelle Adams. If you’re interested in working with Danielle, you can contact her via email or her website’s online contact form to receive a free project quote. Beth Parker is an American book publicist with nearly twenty years of experience in the realm of public relations. She’s worked with companies like Penguin, Random House, and Simon & Schuster. She likes to work with books from a variety of genres including self-help, young adult, middle grade fiction, and picture books. Beth can help you with traditional media marketing, review placements, and blog posts. She unfortunately cannot assist authors who are self-published. If you’re interested in Beth’s services, you can contact her via email or through her website’s online contact form for more information and for a project quote. Jill Danzig is the primary publicist and owner of Danzig Communications. She has over thirty years of experience working in the industry and likes to promote nonfiction books about politics, social issues, science, health, history, parenting, and education. Based out of New York, New York, Jill has worked on campaigns for titles like “Medicine’s Michelangelo” by Francie Mary Netter and “Living Color” by Nina Jablonski. She is able to help her authors identify and market to a particular audience, assist in arranging interviews, book reviews, and media marketing, as well as work with authors to make contacts within the publishing industry. If you’re interested n working with Jill, you can contact her via email for a project quote. Gretchen Crary is the founder of February Media which is based out of New York, New York. Gretchen focuses primarily on working with authors of nonfiction titles about politics, health, business, and journalism, but has also taken up a few fiction campaigns, as well. She can help design and put together a customized promotion plan for your book to help reach a wider audience and generate buzz around your title. If you’re interested in working with Gretchen, you can contact her either via email or through her website’s online contact form for more information or for a project quote. Judy Hilsinger is the founder of Hilsinger Mendelson, a literary public relations and marketing firm based out of both Los Angeles and New York. With over thirty years of experience in the public relations industry, Judy can help you with brand management, media campaigns (both traditional and digital), as well as schedule book signing events and author meet ups. She’s worked on projects like “Be Fearless” by Jean Case, “Drug Warrior” by Jack Riley, and “Hollywood’s Eve” by Lili Anolik. If you’re interested in working with Judy, you can contact her via her website’s online contact form for more information or a free project quote. Kat Purcell is the founder of Pigtail Public Relations, an independent full-service relations firm founded in 2000. With over sixteen years of experience, Kat began her career with Penguin and went on to do freelance PR work. She is able to arrange author tours, establish media coverage, set up book signings, print off promotional marketing material, put together press kits, and provide authors with media training. If you’re interested in working with Kat, you can reach out to her via email or through her website’s online contact form. Be sure to provide your contact information so that she can get back to you promptly. Kathy Daneman is the founder and publicist of Kathy Daneman Public Relations. With over twenty years of experience in the publishing industry, she’s worked with several notable authors include President Jimmy Carter, Carina Chocano, Michael Cunningham, and Tony Tulathimutte. Based out of New York, Kathy has worked on projects like “Role Models” by John Waters and “Sharp” by Michelle Dean. If you’re interested in working with Kathy, you can contact her via email or through her website’s online contact form. She asks that you include a short description of your upcoming title, along with a brief author bio and your expected publication date. Anne Sullivan is a publicist and event consultant who was once the publicity director for The New Press between 2007 to 2011. She’s worked on campaigns for projects like “Eat for the Planet” by Nil Zacharias and Gene Stone, “Reclaiming Gotham” by Juan González, and “How Not to Die” by Dr. Michael Greger. Anne is capable of launching effective publicity campaigns that will help boost book sales, give your title a higher level of recognition, and give you media coverage that will help create excitement about your title. If you’re interested in working with Anne, you can contact her via email or through her LinkedIn profile. Tammy Richards-LeSure is the founder of Richards Public Relations. With over twenty-seven years of experience in the publishing industry, Tammy has worked for large publishing houses like Random House, Villard, Clarkson Potter, Alfred A. Knopf, and Vintage Books. Based out of Texas, Tammy has worked with clients like Sir Conrad Black, author of “A Matter of Principle,” and Greg Louganis, author of “Breaking the Surface.” She is able to help her authors establish budgets and timeless, identify and market to specific audiences, develop press materials, set up interviews for television, radio, and print, as well as arrange book tours and author signings. If you’re interested in working with Tammy, you can contact her via email. Brendan Fredericks is the founder and publicist of Brendan Fredericks Publicity & Management. He has spent several years as an in-house publicist, working for companies like Bloomsbury Australia. He has worked with authors who have written books in a wide variety of genres including genre fiction, poetry, nonfiction, and literary fiction. He currently resides in Sydney, Australia. He is able to assist authors with publishing consultancy, event planning, and establishing interviews with local media channels. If you’re interested in working with Brendan, you can contact him via email to get started on your books’ publicity campaign journey. Katie Mac is an Australian publicist who has been in the public relations industry since 1998. She’s worked with authors like Richard Boele, Paul Gilding, and Avril Henry. She is a member of the Public Relations Institute of Australia and offers her authors with an organized and well-attuned book launching package to help get their books exposed to the market. She can assist in arranging press interviews for your books, book signings and author tours, as well as start up a successful blog campaign for your title. The best way to get in contact with Katie is through her website’s online contact form. Zoe Grams is a Canadian book publicist based out of Vancouver, British Columbia. She is also the founder and primary publicist of ZG Communications. She’s worked with authors like Amy Lombardo, author of “Brilliance,” and Dr. Sayeh Zielke, author of “One Heart Five Habits.” She primarily promotes works of nonfiction about health, parenting, biographies, and travel. Services that she offers includes custom marketing campaigns for your book, strategy development, media relations and management, digital marketing, author brand development, and book tours and events. If you’re interested in working with Zoe, you can contact her via email. Jerrold Jenkins is the CEO of Jenkins Group, a full-service publishing firm that also specializes in book promotion and publicity. He founded the company in 1988 in Traverse City, Michigan. He has worked with traditionally published authors, but also works with independent writers, as well. He can help promote your book, determine the best price to market your book at, as well as provide detailed analytics in terms of sales and your targeted audience. He can assist authors with producing promotional marketing material, pre-publication reviews, and assist with distribution. If you’re interested in working with Jerrold, you can contact him via his website’s online contact form. Be sure to indicate that you’re interested in his marketing services and he should get back to you promptly. Becky Toyne is a Canadian freelance book editor and columnist based out of Toronto who can help promote your book prior or during launch. She has more than fifteen years of experience, both freelance and in-house, and has worked for companies like Random House. She also has experience as the head of communications for the Toronto International Festival for Authors, so she has plenty of contacts and resources to help you get the word out there about your book. She is unfortunately not taking on any new clients for publicity campaigns, but encourages you to check back at a later time when her schedule clears up a bit. For general inquiries, you can contact her via email. 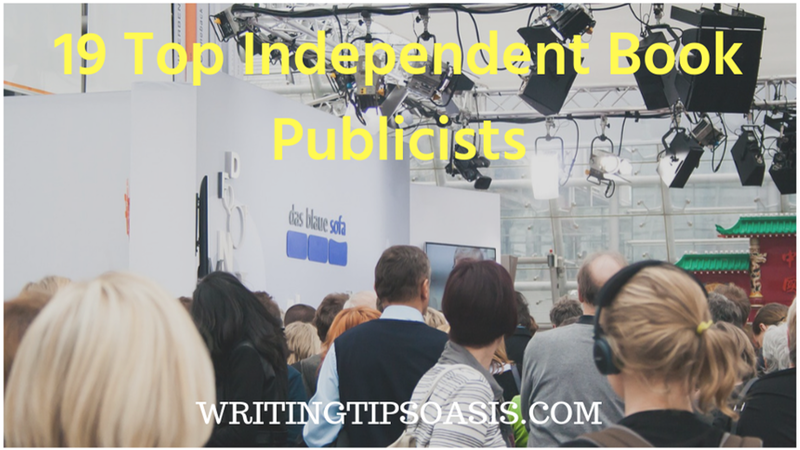 Are there any other independent book publicists that need to be on this list? Please tell us about them in the comments box below!